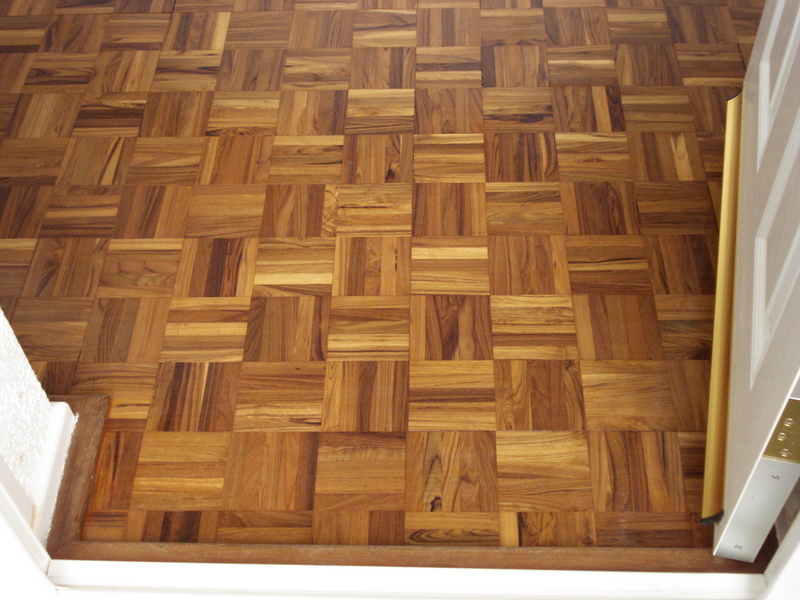 Block / Parquet Hardwood floor Sanding and Sealing by Floorcare Services. 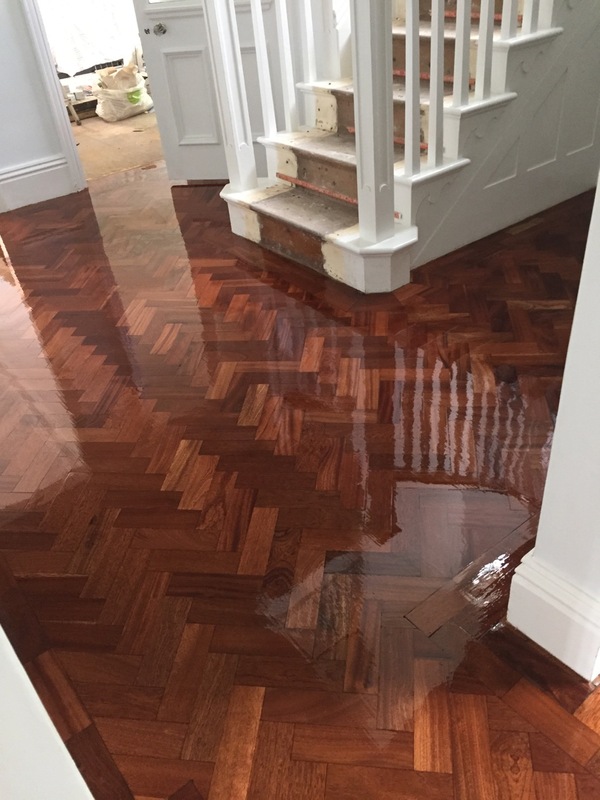 Block Parquet flooring Sanded and Sealed with 1 coat of Floortech Products – Preseal & 2 top coats of Floortech Products – Waterthane Super 100, Hard wearing Satin finish polyurethane seal. 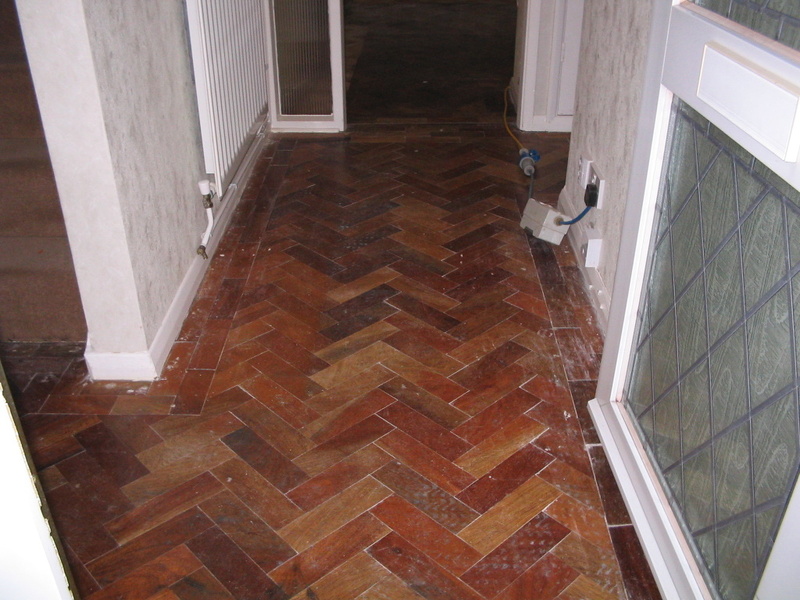 Herringbone block floor Sanded and Finished by Floorcare Services in Ilkeston, Derbyshire. This Hardwood Floor was repaired using dust retained from sanding mixed with resin and filled and sealed over for a perfect match. This Solid Block Hallway floor Sanding and Sealing took only 1 day to sand back to bare wood and sealed with 2 coats, with following day to final coat only. 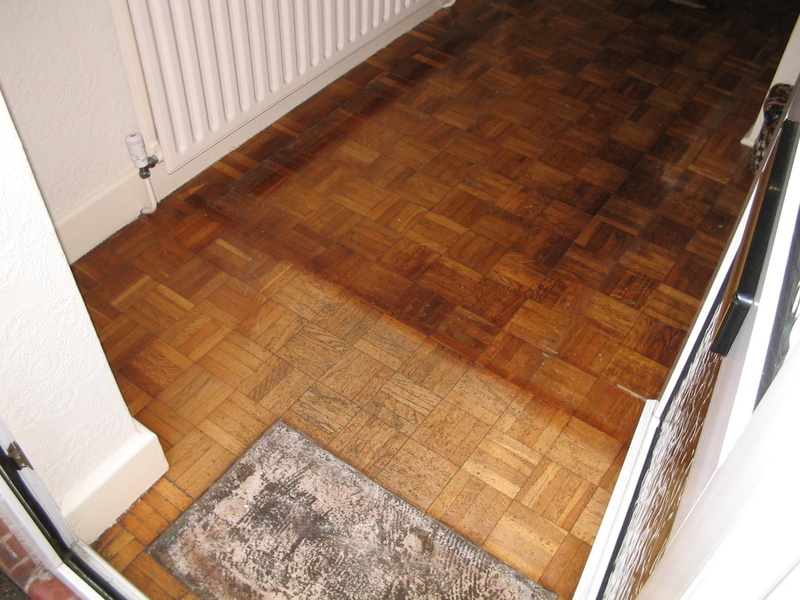 Floorcare Services are floor Sanding and Sealing Specialists. 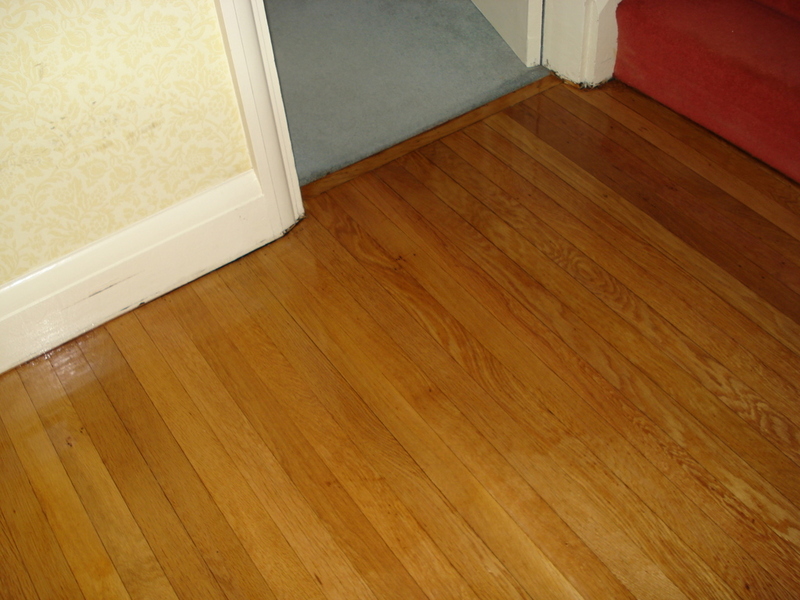 We can restore any Hard or Soft Wood flooring back to original condition Re-sealed with 3 coats of hard wearing polyurethane seal or Hard Wax Oil. 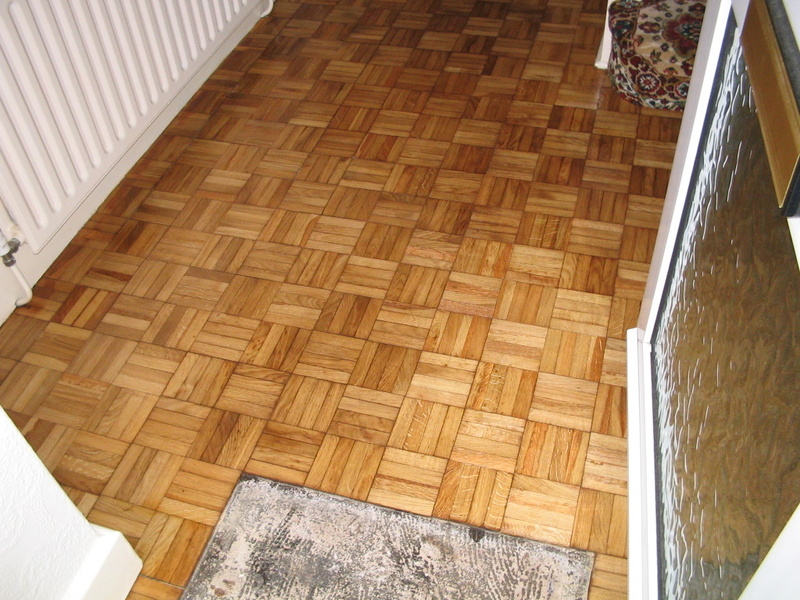 Floorcare Services work with Hardwood strip, Block / Parquet, Mosaics, Granwood and Softwood Floorboards on a daily basis and have the latest equipment and methods to sand the floor back to bare wood and seal with a minimum amount of mess and disruption. All of the tools used to sand the floor have internal vacuum system limiting the escape of dust from the area being sanded. 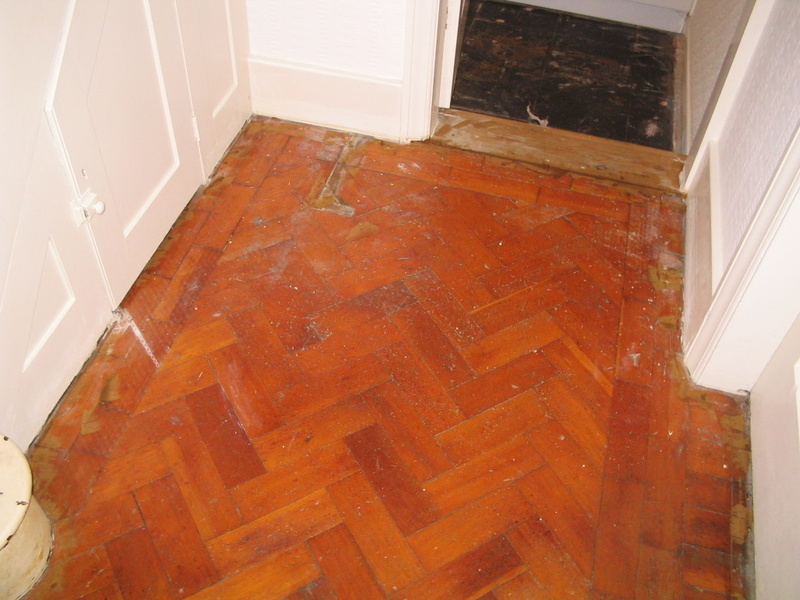 We can repair/replace any damaged areas and also fill any holes using the dust we get from the floor itself. 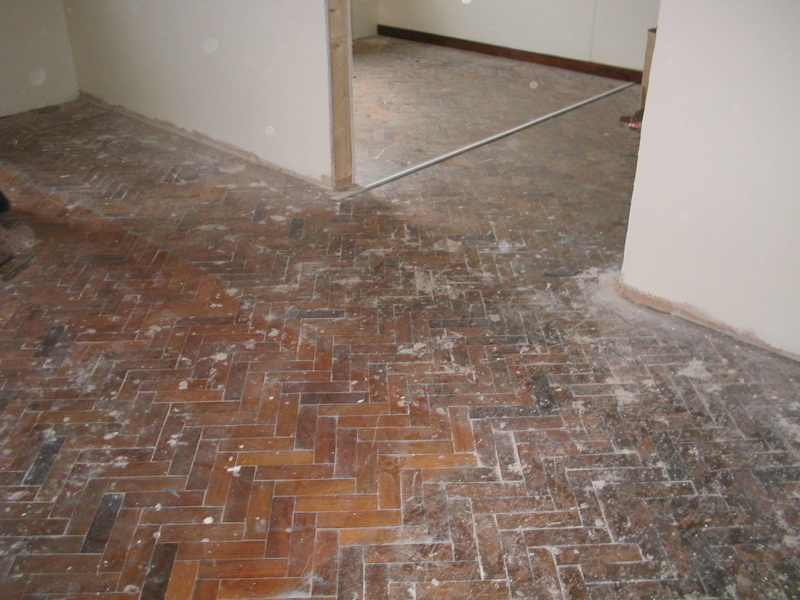 The dust is then mixed with clear resin and applied in the holes in the floor resulting in the closest colour match possible and a long lasting repair. 95% of most domestic jobs can be completed within just 2 days. 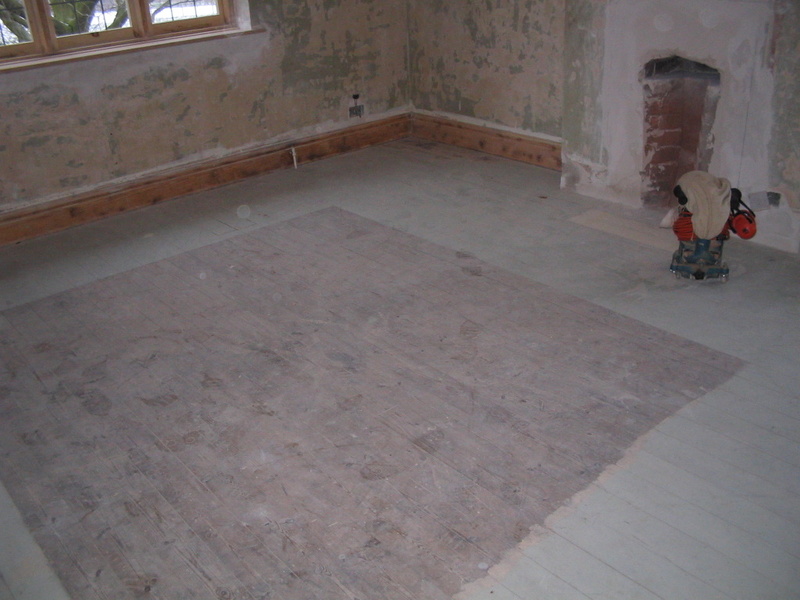 The Second day to ‘flat off’ the floor to ensure its smooth and apply the third and final coat. View the Domestic Floor Sanding & Sealing Gallery. View the Domestic Floor Sanding & Sealing Video’s. 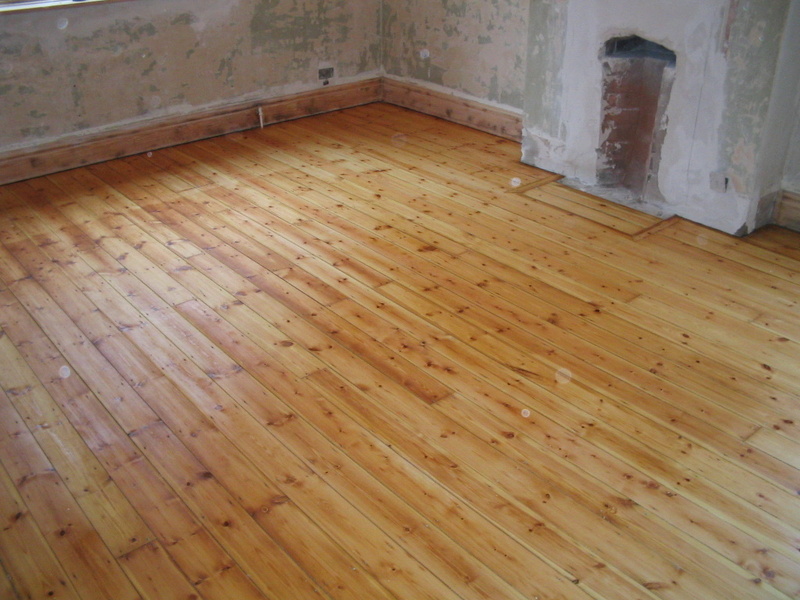 Pine Softwood Floor boards Sanded and Finished by Floorcare Services. This Medium pine floor was restored and refinished with 3 coats of oil based Satin polyurethane seal, in this after photo the floor has had 2 coats of seal with the third coat ready to be applied. 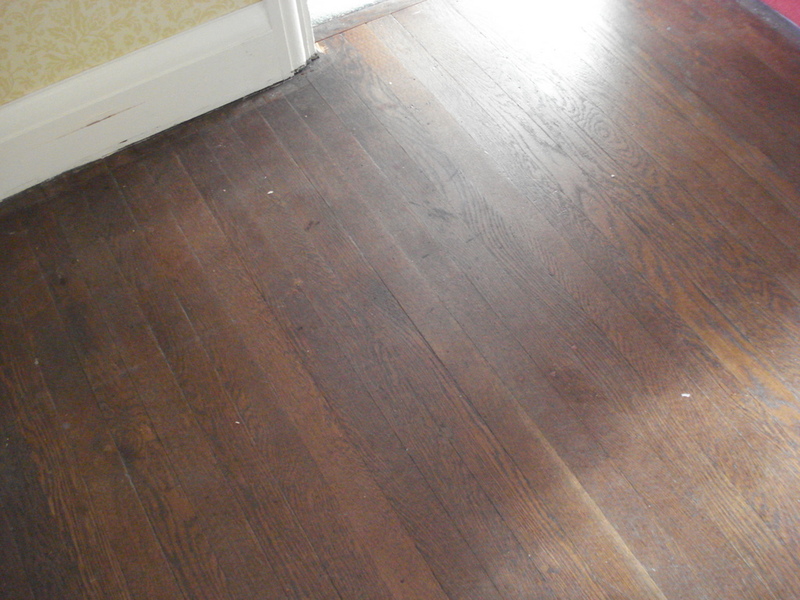 Soft wood Floorboard Sanding and Sealing was completed in just 2 days in Burton upon trent, Derbyshire. 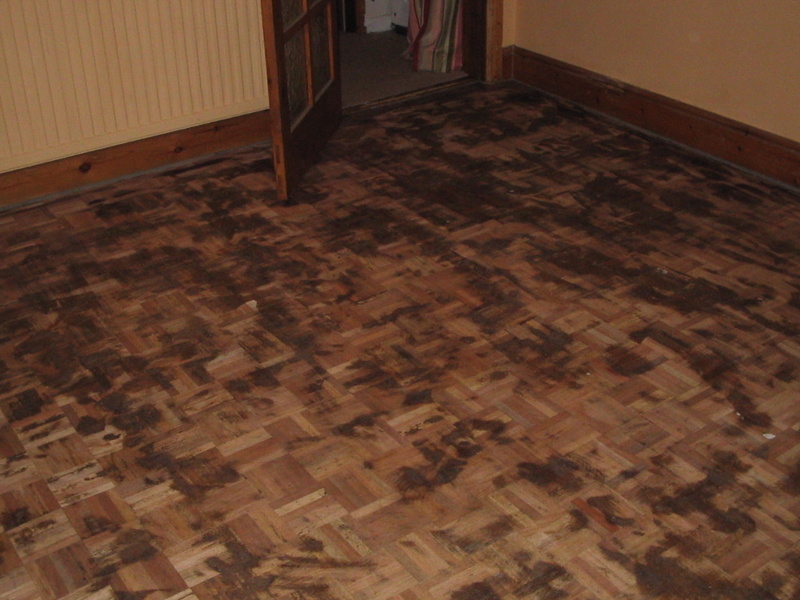 Hardwood Oak Woodstrip Hallway Floor Restoration by Floorcare Services. Previously waxed Oak Strip Hallway Sanded and Sealed with 3 Coats of Satin finish Waterbased polyurethane Seal. Holes caused by gripper bars being nail to the floor were repaired using dust retained from sanding mixed with resin and filled and sealed over for a perfect match. As access was a factor with the floor being a hallway a water based polyurethane seal was used as it only has a 2 hour drying time so the floor could be used when the customer finished work. This Hardwood Oak floor sanding in Allestree, Derbyshire took 2 days to complete, the first day to sand back to bare wood and seal with 2 coats and the following day to ‘flat off’ and final coat only. Hardwood Teak Mosaics Hallway floor Sanding and Sealing by Floorcare Services. Mosaics Hallway Sanded and Sealed with 3 Coats of Satin finish Waterbased polyurethane Seal. This Hardwood Teak floor sanding in Duffield, Derbyshire took 2 days to complete, the first day to sand back to bare wood and seal with 2 coats and the following day to ‘flat off’ and final coat only. All wear marks and scratches have been removed and the floor restored to perfect condition with long lasting hard wearing seal. 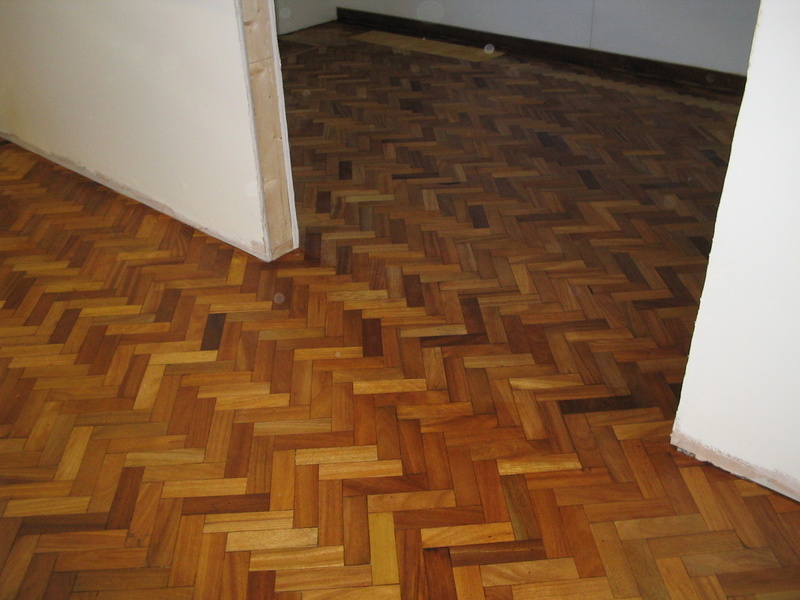 Block / Parquet Sanding and Sealing by Floorcare Services. Parquet flooring Sanded and Sealed with 3 coats of Hard wearing Satin finish polyurethane seal. 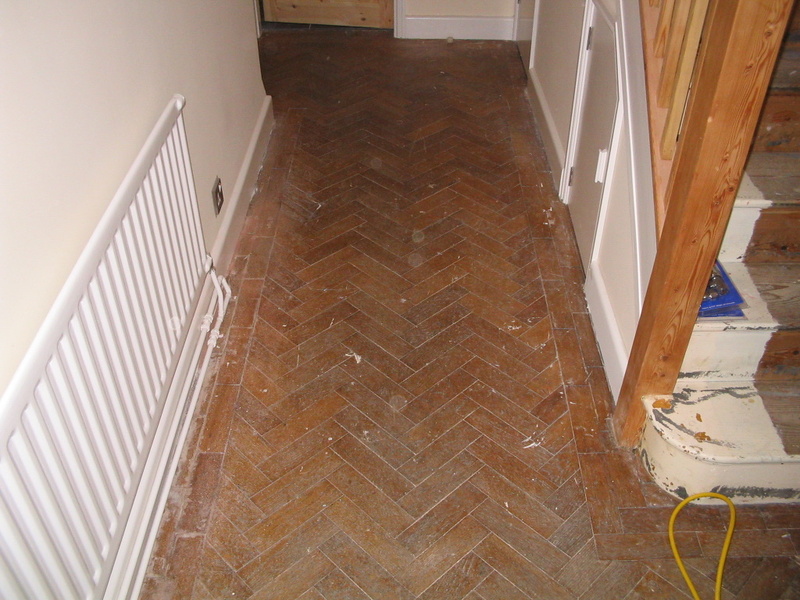 Herringbone floor Sanded and Finished in Barton-under-Needwood, Staffordshire. This Hardwood Floor was repaired using dust retained from sanding mixed with resin and filled and sealed over for a perfect match. Block Hallway floor Sanding and Sealing took only 1 day to sand back to bare wood and seal with 2 coats with following day to final coat only. Maple Block Hallway Floor Restoration by Floorcare Services. 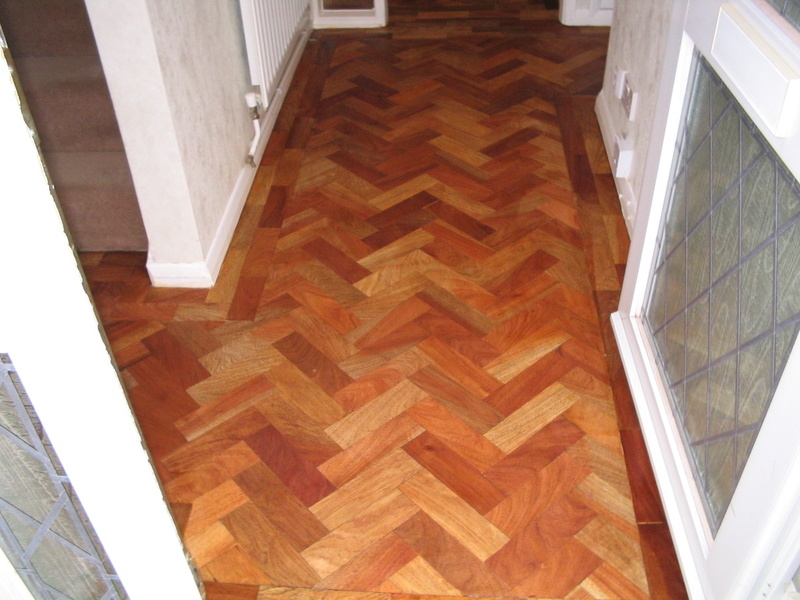 Hardwood Block / Parquet Hallway Sanded and Sealed with 3 Coats of Satin finish Waterbased polyurethane Seal. Loose blocks removed, repaired and adhesived back down. Holes caused by gripper bars being nail to the floor were repaired using dust retained from sanding mixed with resin and filled and sealed over for a perfect match. As access was a factor with the floor being a hallway a water based polyurethane seal was used as it only has a 2 hour drying time. This Hardwood Maple block floor sanding and sealing was in Derby, Derbyshire and took 2 days to complete, the first day to sand back to bare wood and seal with 2 coats and the following day to ‘flat off’ and final coat only. 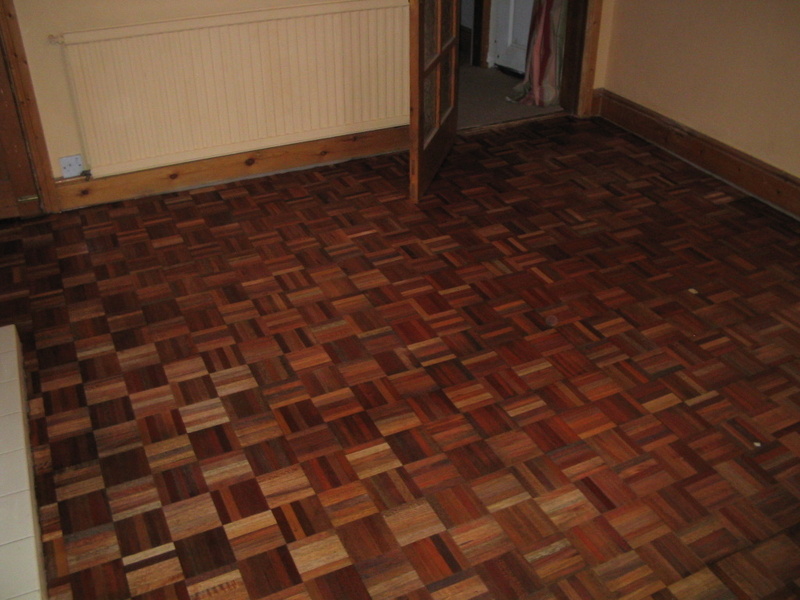 Block / Parquet Floor Refurbishment by Floorcare Services. 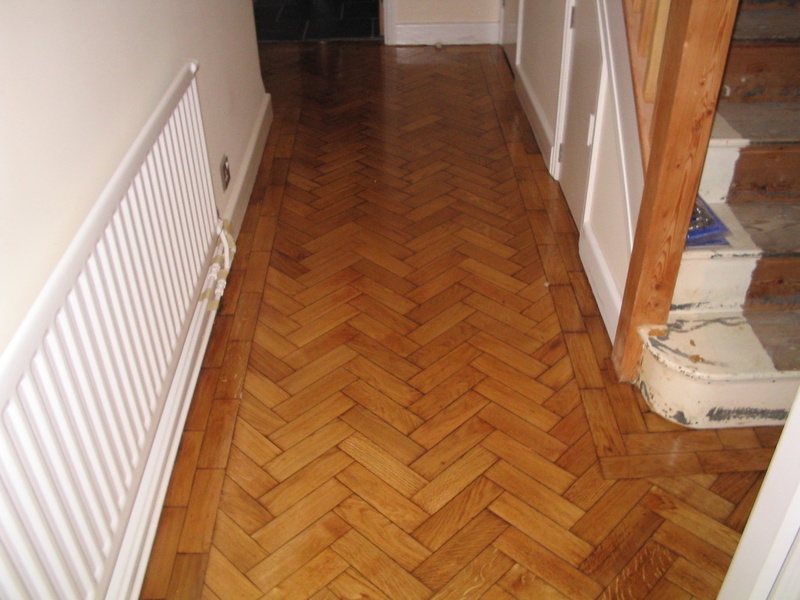 Hardwood Herringbone Block room Sanded and Sealed with 3 Coats of Satin finish Waterbased polyurethane Seal. Loose blocks removed, repaired and adhesived back down. Holes repaired using dust retained from sanding mixed with resin and filled and sealed over for a perfect match. 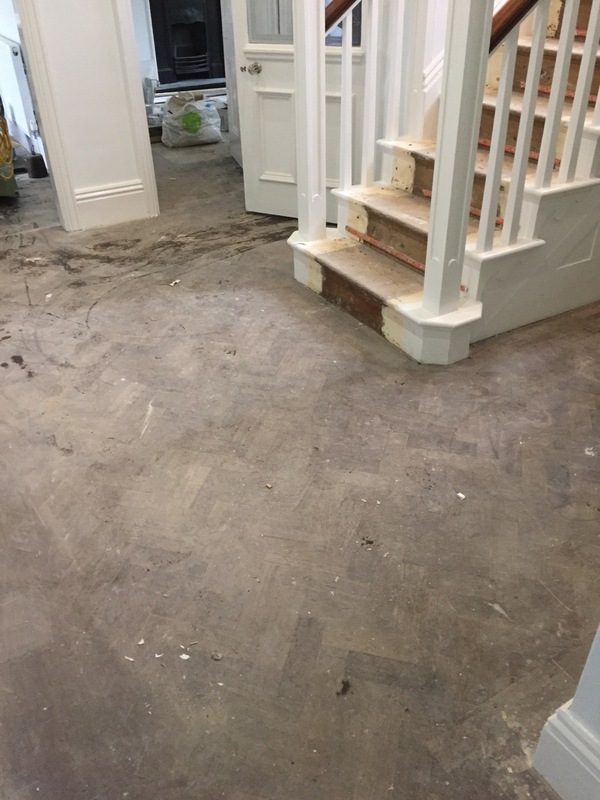 This Hardwood parquet floor sanding and sealing was in Nottingham and took 2 days to complete, the first day to sand back to bare wood and seal with 2 coats and the following day to ‘flat off’ and final coat only. 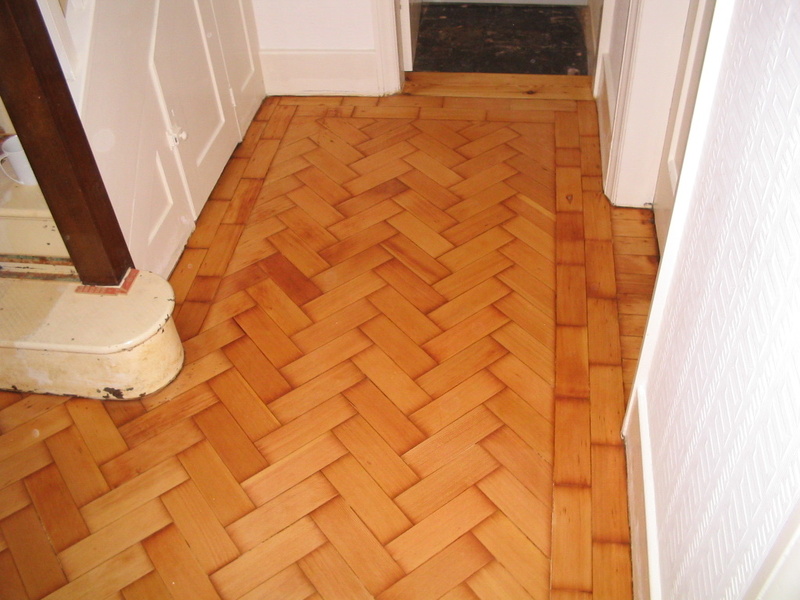 Pitch Pine Herringbone Block flooring Sanded and Sealed by Floorcare Services. This Hardwood Maple block floor sanding and sealing was in Darley Abbey, Derbyshire and took 2 days to complete, the first day to sand back to bare wood and seal with 2 coats and the following day to ‘flat off’ and final coat only. Parquet Hallway floor Sanded Sanded and Sealed with 3 Coats of Satin finish Waterbased polyurethane Seal. Holes caused by gripper bars being nail to the floor were repaired using dust retained from sanding mixed with resin and filled and sealed over for a perfect match. All previous floor varnish has been remove and restored back to it natural colour and as access was a factor with the floor being a hallway a water based polyurethane seal was used as it only has a 2 hour drying time. 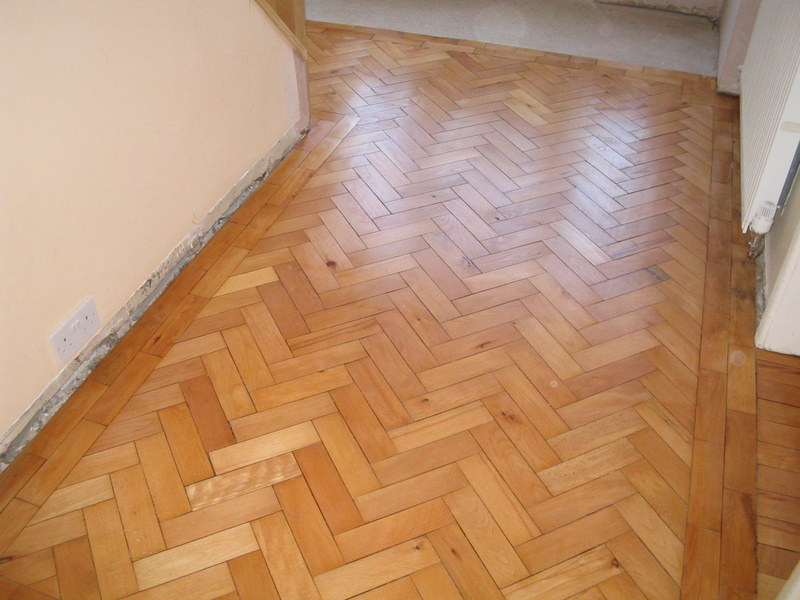 Oak Block / Parquet Hardwood floor Sanding and Sealing by Floorcare services. Oak Parquet flooring Sanded and Sealed with 3 coats of Hard wearing Satin finish polyurethane seal. 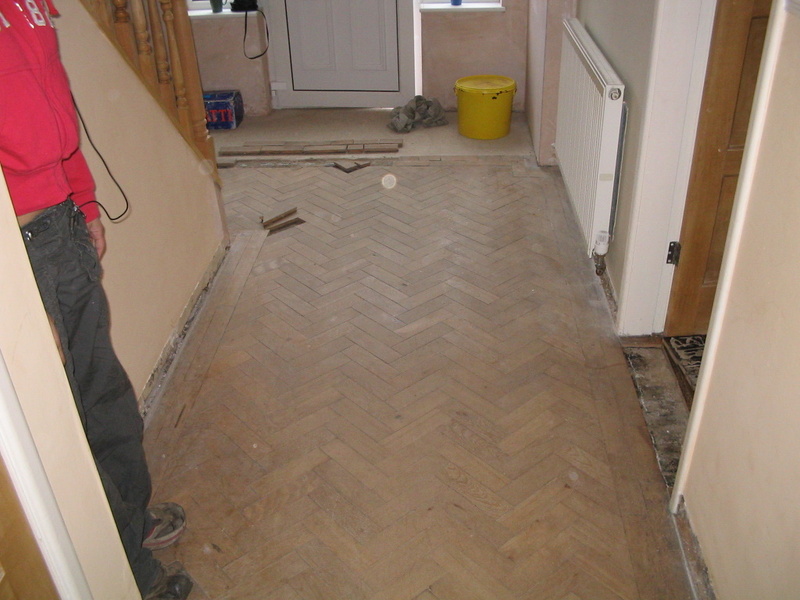 Herringbone Oak floor Sanded and Finished by Floorcare Services in Derby, Derbyshire. This 8 sq M. Hallway Floor Was repaired using dust retained from sanding mixed with resin and filled and sealed over for a perfect match. This Solid Oak Block Hallway floor Sanding and Sealing took only 1 day to sand back to bare wood and seal with 2 coats with following day to final coat only. 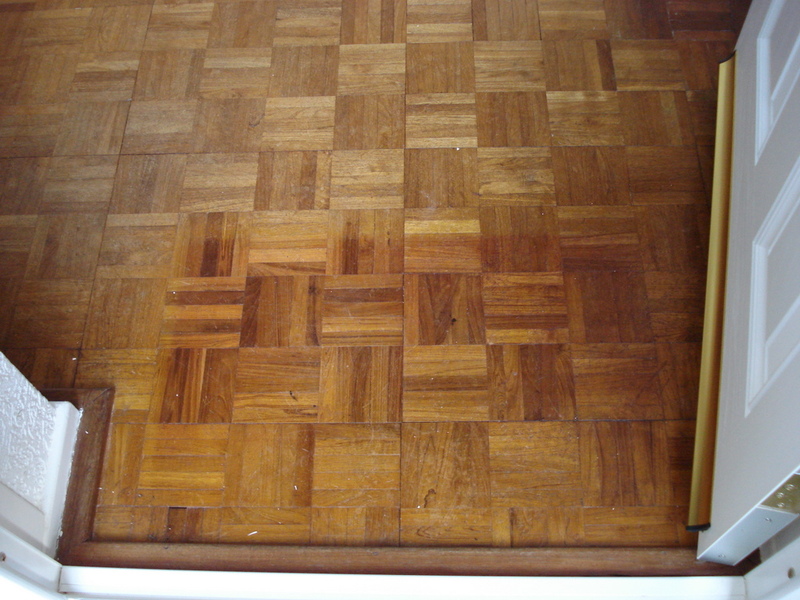 Wood floor Repair by Floorcare Services. Mosaics Oak Hardwood flooring Sanding and Sealing with 3 coats of satin finish waterbased polyurethane seal. Loose fingers were lifted, repaired and refitted to the floor and any holes filled using dust retained from sanding mixed with resin and filled and sealed over for a perfect match. Oak Hallway flooring was sanded back to bare wood, all previous varnish and stain removed and restored back to its natural colour. Mosaics Oak floor refurbishment by Floorcare services was in Uttoxeter took only 1 day to sand back to bare wood and seal with 2 coats with following day to final coat only. Mosaics block floor Sanding and Sealing by Floorcare Services. The customer had tried to sand the floor himself using a hire sander. After the machine snapping sanding belts several times and breaking down he called us to finish the job. We sanded the floor back to barewood and sealed with 3 coats of satin finish polyurethane seal. Holes caused by gripper bars being nail to the floor were repaired using dust retained from sanding mixed with resin and filled and sealed over for a perfect match. Hardwood floor sanding was in Derby, Derbyshire and took only 1 day to sand back to bare wood and seal with 2 coats with following day to final coat only.